I know it’s Saturday, but I don’t think this meal would qualify for Frugal Food Friday unless you got your steaks on sale. 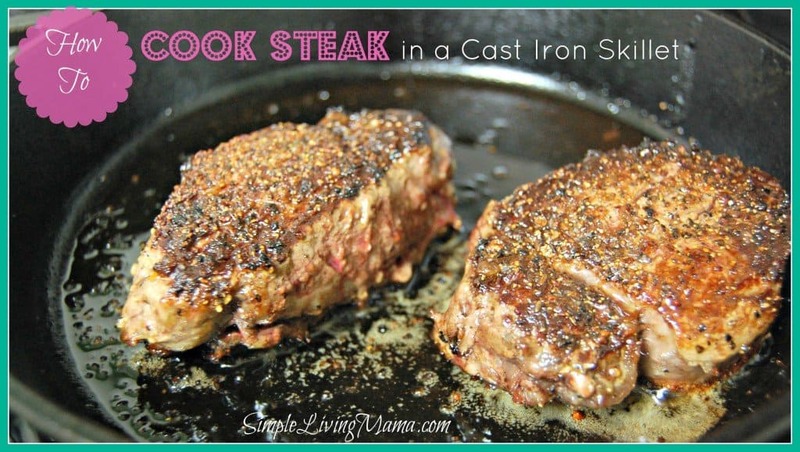 I love my cast iron skillet and I was so excited to add steak to my cast iron skillet recipes. It’s easy and it produces a mouth-watering steakhouse steak that will melt in your mouth. Crispy on the outside, tender on the inside. Let me tell you how. Start off by taking your steaks out of the fridge and letting them come up to room temp. Preheat your oven to 450 degrees and start heating your cast iron skillet on your stove top on high. You want it screaming hot. Season both sides of your steaks. You can do this a couple of ways. Coat each side liberally with salt and crushed peppercorns, or use a steak seasoning like Montreal’s to coat each side. This gives the steaks a flavorful crust. Add a bit of vegetable oil to your cast-iron skillet and gently place your steaks in the skillet. They should sizzle. Let them brown on one side for 2-3 minutes. Do not move them before! Flip and let them brown on the other side. Once the steaks are browned and the sear is locked in, place the entire skillet in the oven. USE AN OVEN MITT! Let the steaks cook for another 4-5 minutes in the oven for medium doneness. We cook ours longer for well-done. If you want rare try 2-3 minutes. You may have to play around with the times to get what you want. Ovens vary. Let the steaks rest a bit when you pull them out of the oven. Top them with a pat of butter while they are still hot. Serve with mashed potatoes and broccoli OR baked potatoes and salad. This is an excellent meal for an at-home date night! An easy way to get steakhouse steaks without the grill! Preheat oven to 450 degrees and heat cast iron skillet over high heat on stove top. Sear both sides of steaks in skillet for 2-3 minutes per side. Transfer skillet to oven and continue cooking for 4-5 minutes for medium. Allow steaks to rest before cutting. Melt a pat of butter over each steak before serving. Adjust cooking times based on how done you like your steak. Ovens will vary, so cooking times may not be exact. Always use an oven mitt when handling a hot cast iron skillet! Stopping by from #BB100. I am going to have to try this! We love a good steak but are currently without a grill. This looks like a fabulous idea! Yum! I hope you like it! It was so delicious! Stopping by from #BB100! I have always wondered how to make steaks in the wintertime when we can’t use our gas grill outside and I hate using the messy broiler. This is a great idea! Sincerely, Jenni recently posted…No big deal, but I’m co-hosting Wine’d Down Wednesday this week! It is so yummy and perfect for wintertime! You have to try this method! It’s so good! This method makes such a delicious steak! We do it regularly now! I just happen to have a rib eye in the fridge, and an old black iron skillet that belonged to my mother and i will try this method of cooking steak TODAY!! I used this method about a month ago and they turned out great. Thanks for sharing this, will never cook steaks again any other way than this…..